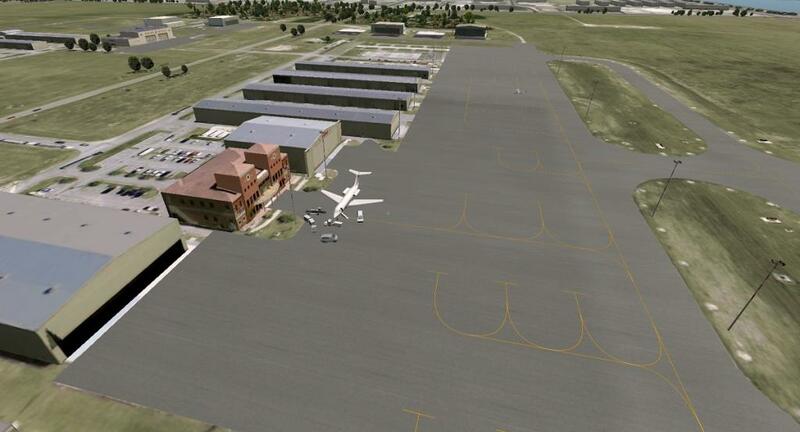 Drzewiecki Design (DD) are well known for scenery and airport development, not just for X-Plane but for FSX and Prepar 3D as well. 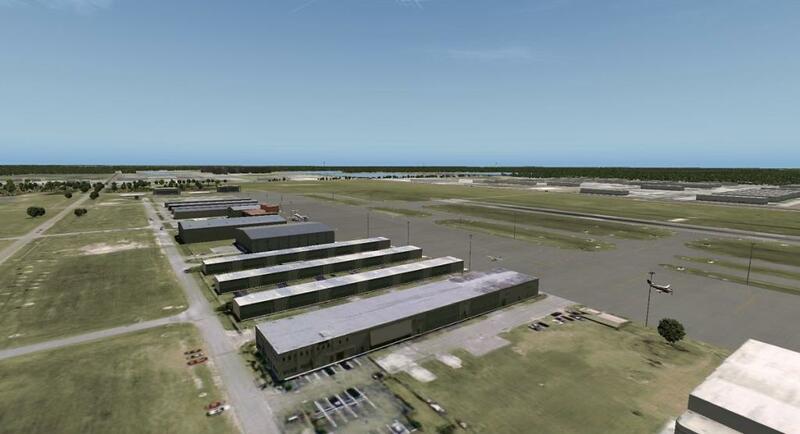 With 7 scenery packages on the x-plane.org store covering 20 airports DD offer a wide range of airports all over the world, primarily covering the U.S and Poland. The latest release from DD goes by the name of Miami City XP. 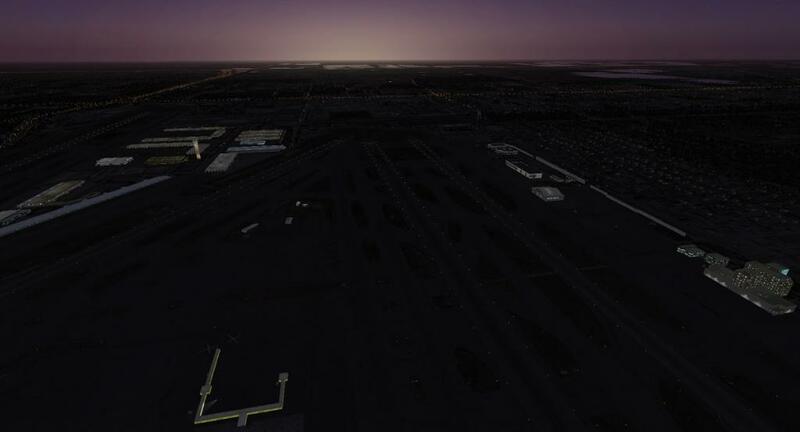 The scenery covers three airports with 'lite' detail including KMIA Miami Intl, KTMB Kendall-Tamiami Executive Airport and KOPF Opa-Locka Executive Airport. Drzewiecki Design provide a very vast scenery with Miami City XP, as you would expect from the title this scenery covers the majority of Miami City. Developing scenery for a whole city is a big challenge, but it seems that DD managed to pull it off. They managed to do this by first underlaying the majority of Miami City with an orthophoto (aerial image), then the 3D buildings are a mix of custom and autogen. The autogen looks great, you really get the 'American' feel of a big city leading off to small suburbs, whats great is the orthophoto fits well with the roads and houses placed on top. The custom buildings come into action within the airports and along the coastlines, the coastline office blocks and tall infrastructures blend seamlessly into the environment. Installing Miami is very simple (for windows) as there is an installer. After following the steps Miami will install for you. If you are a Mac user I believe you have to install it manually, but don't panic if you don't know how to do that as documentation is included. First we start with Miami International Airport, (from the author) this airport also known as MIA and historically Wilcox Field, serves as the primary international airport of the Greater Miami Area. One of the busiest international airports in the world, Miami International Airport caters to over 35 million passengers a year. Identifiable locally, as well as several worldwide authorities, as MIA or KMIA, the airport is a major hub and the single largest international gateway for American Airlines, the world's second-largest passenger air carrier. Miami International is the busiest airport in Florida, and is the United States' second-largest international port of entry for foreign air passengers after New York's John F. Kennedy International Airport, and is the seventh-largest such gateway in the world. The airport's extensive international route network includes non-stop flights to over seventy international cities in North and South America, Europe, Asia, and the Middle East. The 3D models can be classed as basic but still represent the real life variant accurately. 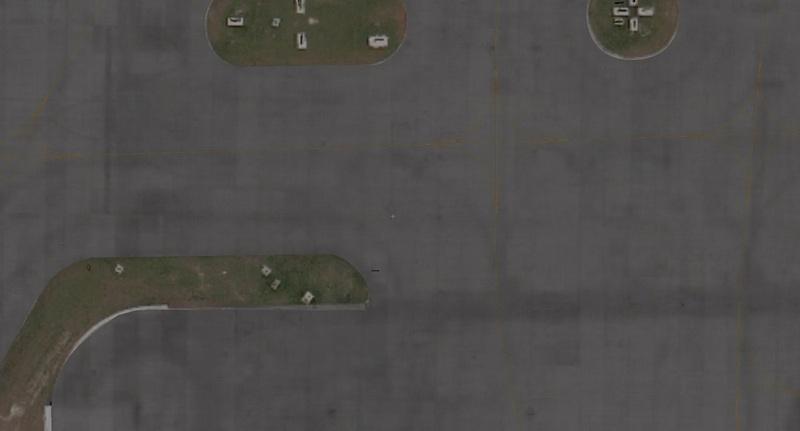 For example you will recognise the infrastructure but attention to detail such as 3D set back door inlets are missing, however this airport is very large so therefore as of the size of the airport sacrifices have to be made. 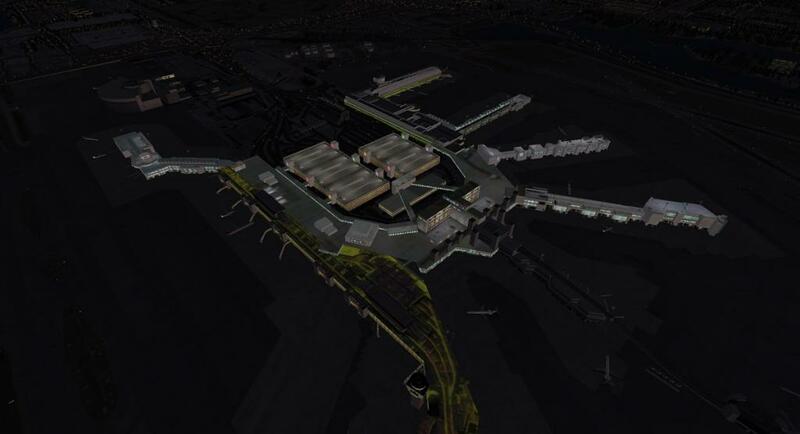 The 3D modelling of the jetways is very good, this is significant as this is where you will start most of your flights. 3D modelling of ground vehicles is second to none although I believe that the ground vehicles and models are from the default X-Plane library? Therefore credit can't quite be given there. The apron lights have been modelled with precision, by looking closely you can really see the attention to detail, again this is significant as these are objects that you will see up close. Textures on the sides of buildings at KMIA is very good, all textures are at a good resolution to emulate the real MIA and real life. Despite those textures being good the roof textures don't carry the same standard. The roof textures have been mapped with weird looking polygons in places and overall have a lower resolution from the textures on the side of the buildings. From about 1000ft up the roof textures look good as it makes the buildings blend in with the rest of the scenery however the closer you get the worse it looks, although you will most likely only see those roof textures flying above the airport anyway. The lighting at MIA gives off a 'white' illumination, this looks great when mixed with the orange spill lights scattered around on the city. It also helps you find the airport amongst the bright city! The night textures on the jetways also looks good, you get the sense of lights along the top of the jetway giving a realistic feel, although those lights are not HDR 3D lights, the jetway lights are baked into the night texture. The textures at night on the roof are very bright, maybe they could be darkened to make it a little more realistic. The aprons feel a bit 'bare', however for the price you pay and the vast area you receive and three airports, attention to detail has to be a sacrifice. The 3D models described above can be found scattered around, but as for dense realistic vehicles everywhere making it emulate the real thing, this isn't that. That is what is meant by a 'lite' scenery. It is a shame that the airport lacks in dense objects making it very detailed and realistic however the area and number of airports you get just makes up for that. 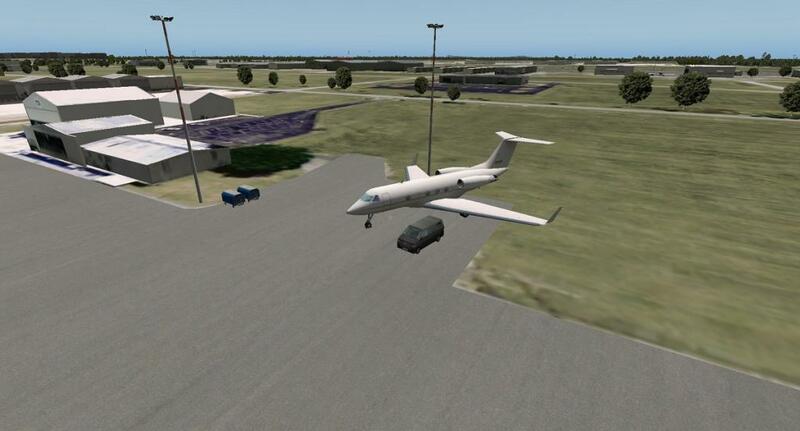 Unfortunately there is no ground traffic which takes away from the realism slightly, although this is something that could be added within an update as it is simple to add. Secondly we have KTMB (from the author) KTMB is a public airport located in unincorporated Miami-Dade County, Florida, United States, 13 miles (21 km) southwest of Downtown Miami. 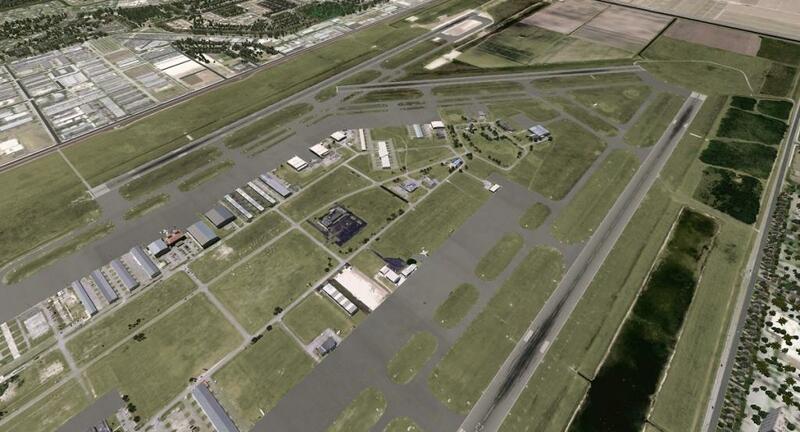 The Kendall-Tamiami airport is owned and operated by the Miami-Dade Aviation Department. There are 450 aircraft based at this airport: 69% single-engine, 20% multi-engine, 8% helicopter and 3% jet. This 'lite' KTMB airport features the extended runway 9R/27L. The runway has been extended 550 feet to the east and 1,798 feet to the west. All airport buildings are included. KTMB is a great airport to start a flight if you want to fly VFR around Miami city and take in the scenery in a cessna. The reason for this is its size and environment. KTMB can't be classed as small, as compared to a UK airport it isn't. However KTMB lacks in mass buildings and complex terminals making it the perfect environment well suited to a small aircraft. 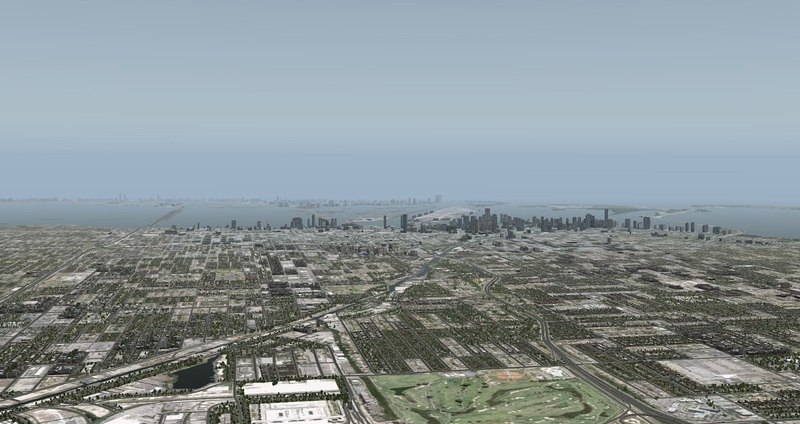 If you are flying over Miami City I would certainly recommend this location to start your journey, its close (only a few nautical miles from the big city), although trying to actually do this whilst maintaining good frame rates can be an issue. First impressions of KTMB? Mixed opinions really, all buildings are custom modelled, textured and included. So you won't find any buildings that are not included by which the roof is on the floor, this is a nice touch of realism especially when flying over the airfield. I also like how this airfield is mainly grass, it gives a break from larges areas of concrete and massive cities. The 3D models at KTMB are basic, but again it is a 'lite' scenery so I guess you can't expect too much, but wouldn't you expect more? All buildings are at the correct height perspective and blend well with the orthophoto. 3D models of ground vehicles are equipment lacks again at this scenery, it's a shame as its nice to have objects around you whilst parked on the ramp. Despite a lack of aviation ground equipment there are 3D static aircraft included within the package, along with a few 3D cars / vans to accompany them. This is a nice touch and means that the something is on the ramp, despite that it is a bit bare. The textures on the buildings at KTMB are slightly blurry, not a massive downfall but still an element that takes away from the realism. Again, as with MIA, the roof textures are blurry and really bright at night. 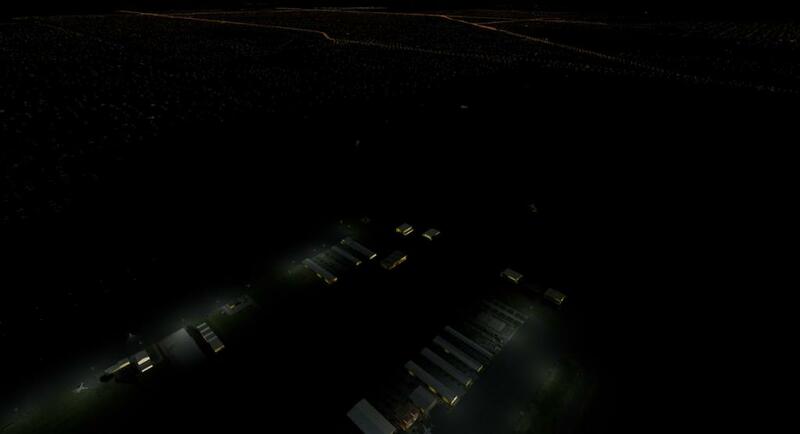 Although there are ramp lights illuminating a vast area, the majority of the night lighting is baked into the night textures. With HDR off this means that frame rates increase yet you still get the night lighting effect, a nice touch, especially as frame rates are a slight issue I had with this scenery which is discussed in the conclusion. The baked night lighting has been done very well, the sense of night can really be felt at and around KTMB. Some areas are a little dark as well, this gives it that 'remote' airfield feel which is nice since its very close to a big city. Last but not least we examine KOPF, Opa-Locka. (from the author) is a general aviation airport and joint civil-military airfield 10 miles (16 km) north of Downtown Miami, primarily in metropolitan Miami, Florida, United States, with a portion within the city proper of Opa-locka. The airport's control tower is manned from 7:00 AM to 9:00 PM. In 1926 Glenn Curtiss founded the City of Opa-locka. In late 1925 he moved the Florida Aviation Camp from Hialeah to a parcel west of the city. This small airfield was surrounded by the Opa-locka Golf Course. In 1929 he transferred this land to the City of Miami, and the city erected on it a World War I surplus hangar from Key West. This field became known as the Municipal Blimp Hangar. The following year, the Goodyear Blimp started operations out of this hangar. In 1928 Curtiss made a separate donation of land south of Opa-locka for Miami's first Municipal Airport. The Curtiss Aviation School later moved from Biscayne Bay to this airport. In 1937 Amelia Earhart started her attempt to circumnavigate the world from this airport. OPF is a very large airport with three runways this makes it great for flying small GA or larger aircraft. 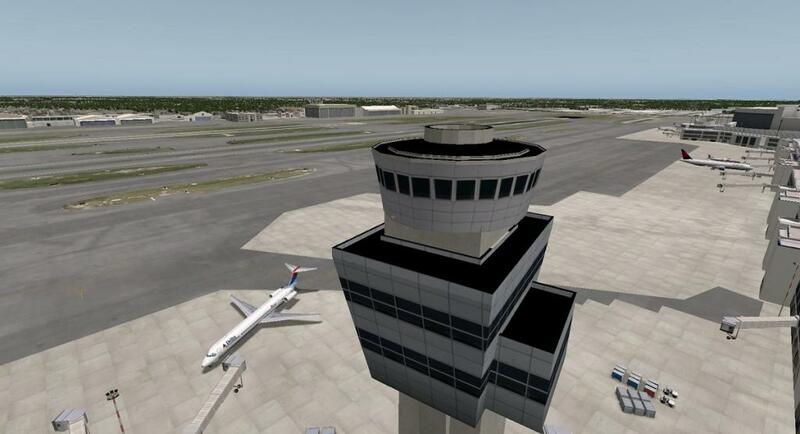 As with other airports in Miami City XP, included are 3D custom buildings however I noticed in this scenery not all institutions at the airport are included. Obviously all major buildings are included within the airport just not smaller, more minor buildings. The 3D buildings are fairly basic again within this 'lite' scenery, attention to detail is basic, however all buildings easily emulate their real life variants. Textures at OPF are blurry when up close however have details included, by this I mean that the resolution is low however details such as doors and air vents can still be identified. 3D ground vehicles and equipment are more persistent at OPF, there are more static aircraft and vehicles that can be found. The texture detail and resolution of the statics are good and really stand out at the airport. Yet again, more equipment placed on the ground would be a nice touch to add realism to this airport. The autogen doesn't quite flow into the airport as well as it does in other areas, you can see that some autogen roads would look much better as orthophoto roads instead. These are just really picky points though. Night lighting is good at this airport, there are areas of brightness and darkness which give a great sense of environment. The roof textures at this airport seem to be slightly darker as well which is good to emulate more realism, at MIA the textures on the roof are too bright at night giving an unrealistic experience. Although to notice this you have to fly above the rooftops at night and this airport is primarily GA aviation. 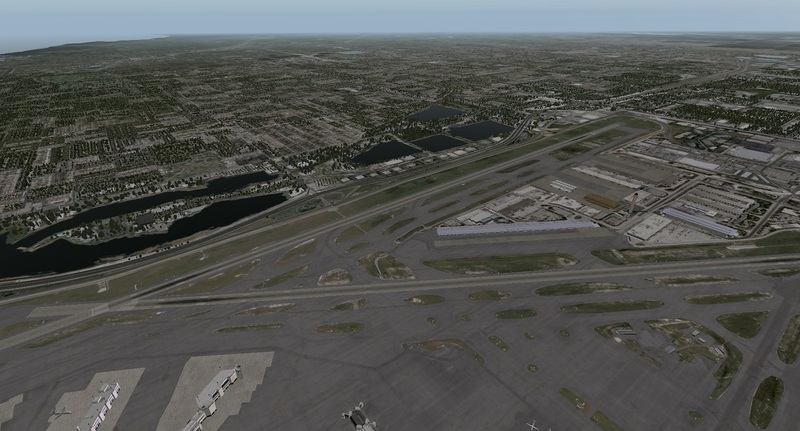 This scenery package is a big one, three airports and Miami City with an orthophoto covering the whole thing! Overall it makes a great addition to your scenery library, whether flying international flights or GA VFR these airports and the vast scenery coverage is great! In many places the airports lack close attention to details and many aprons seem very bare and empty, but for the price you pay and the area you get balances my opinion. 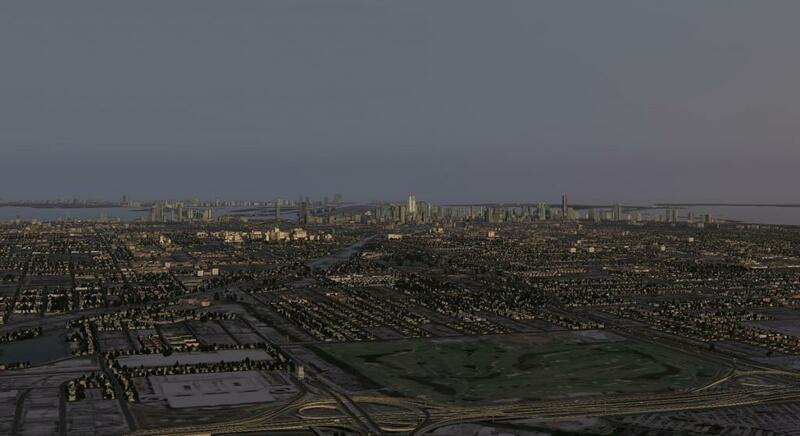 Below are four screenshots of the skyline city view which really makes x-plane look great! The images below speak for themselves, DD have done an amazing job recreating Miami city to give it a very realistic flare. So I have covered everything great about this scenery package, although are there any drawbacks about this scenery package? Area coverage is phenomenal, it's just the level of detail in some areas is restricted but all three sceneries are 'lite' and therefore sacrifice the small details. You would also think these 'lite' airports would be good for frames although on my machine I seemed to suffer dramatically with a lagging x-plane. That said, if you can get x-plane up and running Miami City with good frames rates, flying VFR around the highrise city is fantastic it looks and feels realistic which is the main aim of the scenery. 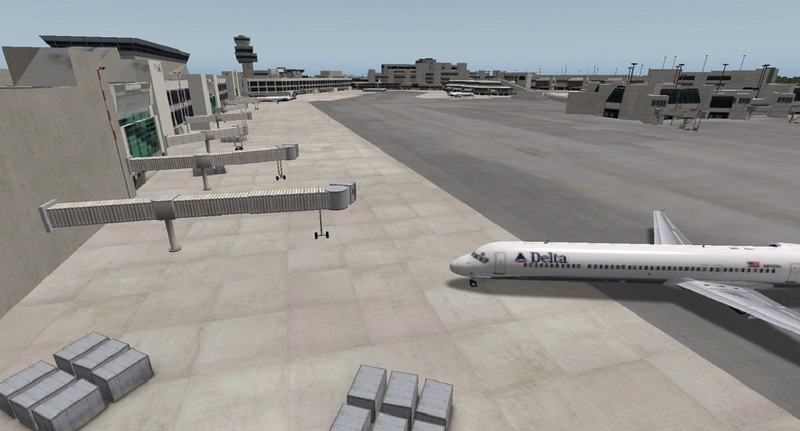 You could argue that the airports lack in extreme detail however Miami City XP is three airports for the price of one! I highly recommend it to be in your custom scenery folder! Where can you grab this scenery from? 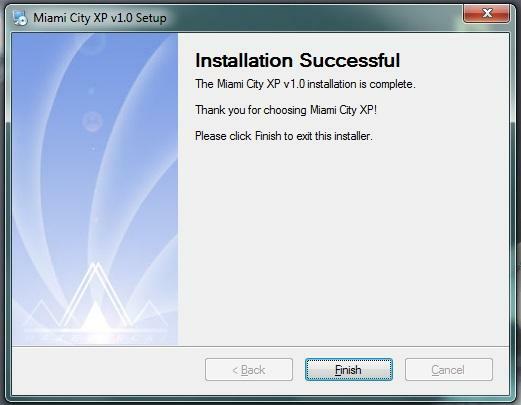 Miami City XP provides a basic model for the Miami area, which may or may not be satisfying to all users. The good thing is, this product captures most of the scenic buildings that give Miami its face. That includes downtown, the beaches, distance areas like Byskane and some of the airport surroundings. The highways that connect the Airport, Downtown and the Beach seem done properly and are satisfying. 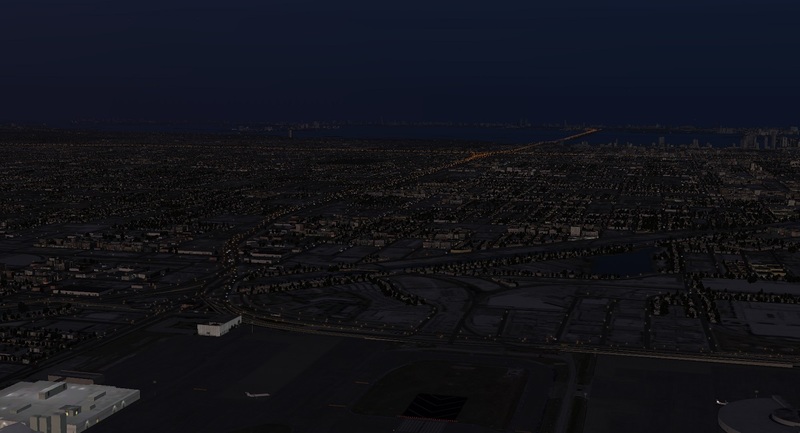 i recommend this product over the default scenery, Miami City XP covers a large area with some fundamentals you definetly need to fly in and out of Miami. this spectacular vacation destination, i would have expected a much more detailed and more properly done scenery. - Ugly textures (famous buildings not recognizable), night illumination missing. Miami Tower (Downtown scenic building) and other Miami features are hard to recognize since their textures are not done, night illuminate facades completely missing. - Downtown, the Beach, the suburbs, the airport, totally dark after sunset. In real life this city and the whole metro area lights up like disco. - Miami River completely undone. - Art Deco District completely undone. - The islands along McArthur Causeway completely undone, so is the Causeway itself, no palmtrees, no nothing. - Miami Seaplane Base completely missing. - over water highways (mcArthur): modelled object not arranged with autogen road. One road goes sea level, the other is 30 feet up in the air. - Does not combine with other beautiful ortho photosceneries (available for free), ocean watermarks with their sandbanks simply overpainted with ugly default waters and beachlines. - Folder structure: The 3 folders that cover this product can not be sorted properly in the scenery.ini file so that ortho photos could come alive. - The entire miami beach key from north to south is completely unvegetated, no attention to landscape design. Destination Miami is a "must have" for every Aviator, an would have deserved much harder work than what drzewiecki-design delivered. staying at this place would not meet your expectations. and never should have been released at that low quality standard. like florida 1m ortho (free download) and of course the magnificiant payware Miami Intl. 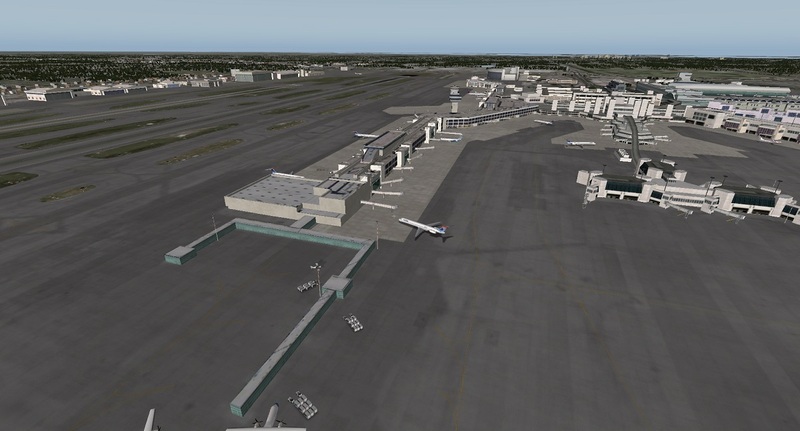 Airport by Nimbus Simulation. 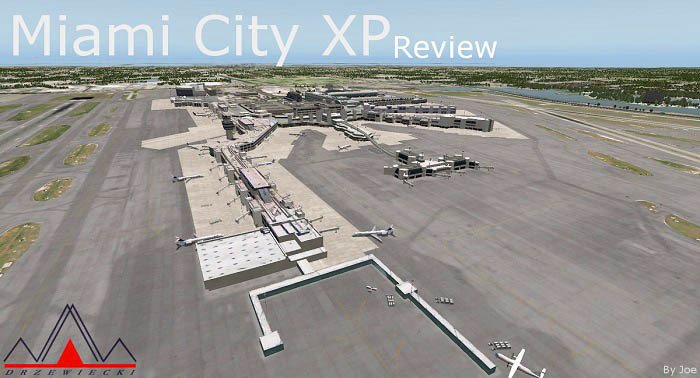 Overall Rating for Drzewiecki's Miami City XP: 5 of 10 stars. And a warning card. this has been an independant review by an individual user and may not necessarily cover anyone's view. 1. What is X-plane's problem? Can't be the product. i am happier with it than with anything else before. and i had them all. The physics, the sounds, the configs, the structure, everything makes sense and does a great job. start creating stuff for xp first and then convert it to other platforms, it is rather vice versa. xp11(.11) is even more advanced and has all options to become the one game changer over anything out there. Honestly, i have a hard time understanding why xp has kept the niche player role. xp's weaknessess are calling for new players, aerofly would attack on the Scenery and VR side, but fails in physics. aprx. 5 other devs come with more action-packed sims that i would call arcade. DCS can't run on a regular worker's PC at all. but the scenery market issue is a key issue which has to be addressed and solved, before others take over the market. So, what does Austin & Co. need to look at? a. What blocks devs? is there a problem in the distribution line? lack of profitability for scenery creators? number of users too small? laminar policies or .org-issues? b. how big are the numbers? if you tell the numbers of users on the various platforms, it becomes easier to locate the issue and understand what needs to be done. c. what does a flight sim have to be? is it enough to release the naked skelet and let add-ons fill the pot, or does laminar need to go a new way and do some extra effort? looking at aerofly, i would assume that laminar should have a focus on the scenery thing too. Why not coming up with default ortho? d. how is x-plane's marketing? maybe the product needs a complete refresh on the GUI/product design and Communications Side. It goes far deeper than X-Plane just being a better simulation. Flight Simulation/P3D has had a long lead in decades of development and a whole industry has been built around that foundation, were as X-Plane was always a more clubby but a more innovative flight sim. This created that for FS/P3D to change in any direction was a hard thing to do and still is, were as X-Plane could and still does turn on a dime. The biggest barrier is that most FS/P3D developers want X-Plane to adhere to FS/33D rules and and their way of thinking, which is the totally wrong approach. Your initial review of this Miami XP proves that point, in transferring FS/P3D scenery (or aircraft) to X-Plane and just expecting it to work is their biggest problem? The smart ones used great X-Plane developers like with Carenado that uses Thranda to do the excellent conversions and they are one of the great X-Plane success stories, but any FS/P3D developer who did it their own way was usually a total failure. I don't think that Laminar needs to do anything else but do what they are already doing well. X-Plane11 is the real game changer in this respect and they have already totally revamped their marketing, and finally old school FS/P3D users are finding out that X-Plane is a far better simulation than the outdated FS/P3D sim. 100.000 new users switched to XP11 in the last twelve months and that will double in the next, as the users (or their money) comes then so will the developers, JustFlight has just started releasing and Orbix is also now coming, and so will a load of others. The tide is turning. Every month, the community is constructing the world piece by piece, city by city, downtown skyline by downtown skyline, World Traffic 3 ground route by World Traffic 3 ground route. And there a handful of community leaders that are leading the charge. They seem to have limitless time and energy. And I want to thank you, Stephen, because you too are a community leader. You are The guide through the rapidly expanding catalog of aircraft payware and plugins. Having followed X-plane ever since I first read about it in Popular Mechanics, the progress has been staggering, and over the last year, meteoric. But it is mostly a great community effort, we are building X-Plane through that spirit and I am proud of that and what we do we love. xp11 has set the benchmark we all waited for, i fully agree to both of you. and even aim for the extra mile. The journey has just began. Hey guys so a couple of questions here. 1. I own Nimbus KMIA, can KMIA be placed on top of this scenery and can I delete the plain basic scenery from KMIA? All other items I would like to have. 2. Is there an update on the FPS with the latest version of XP? i know the initial review was done some time ago. You must put Nimbus on top of DD Miami City in the scenery.ini for that both products are visible. (sorry for the correction Stephen). but DD's other 2 regional airports will still show. From this point you can add or remove objects as mentioned by Stephen via the Overlay Editor Tool. You don't want to change things with Nimbus as that one is perfect already, so make sure you open DD_Miami_City_XP's .dsf file. so use the exclusion zones function in the overlay editor to organize forests, residentials, roads and office facades. it's a bit of a work to simulate the real thing, if that is what you want. I did want it caus i love flying MIA. I have reworked most of DD's Miami for my own purpose, added Night Bridges over the bay, created the Stadiums (e.g. Merlin Park) to make this area timeless, or lets say independant from the need of future updates. DD's Miami off the box is a sloppy conversion from their previous FSX release and all the 3d-buildings were stolen from Google, that's why the Drzwiecky thing looks so terribly outdated and bad coloured when it comes to the textures. I talked to the guy from the polish developer , and it does not look like they have big interest in releasing updates on Miami. To get a good Miami Feeling, the buildings must be repainted to white and nice and the beach areas require a lot of corrections. I ran all the building textures thru a photoshop emulator to whiten and contrasting them to a more realistic look. I also created the Miami Seaplane Base which was forgotten and which is being revived in real life with a complete overhaul and with new superdesign terminals. the flight experience is breathtaking, if the geo-visuals are done nicely. DD's package does not show the beautiful sandbanks in the bay or in the outer beach sections. But when using ortho over DD's own terrain you need to do a little delete-job on their own terrein tiles and that can cause errors if not done right. Let me know when you reach this point.